Driving a motorcycle is an experience without equal, but when another motorist’s negligence involves you in an accident, your entire life may be wholly changed by no fault of your own. Unfortunately, insurance companies will not hold you in their best interests and may pursue measures to minimize their financial liability, or even shift fault. At the Shiner Law Group, we understand these defensive tactics and aggressively pursue the best results to secure the financial compensation you deserve. If you have been injured in a Florida motorcycle accident, contact our experienced motorcycle accident lawyers to discuss your case in a free consultation, as you may be entitled to financial recovery. You have the same legal rights and protections as other motorists. Don’t let an insurance company take advantage of you. Most motorcycle accident injuries are catastrophic and result in significant medical costs for the victim, which means that insurance companies have more money at stake. Agents may obnubilate policies and responsibilities, argue the validity of a claim, or attribute increased medical concerns to preexisting conditions. More importantly, victims are not entitled to personal injury protection (PIP) benefits, which makes securing legal representation vital to obtaining substantial and favorable results. Motorcycle accident victims can pursue a personal injury claim against a negligible party within four years in the state of Florida, or two years in cases of wrongful death, for a broad range of damages resulting from pecuniary loss, including, but not limited to, pain and suffering, medical treatment and rehabilitation, lost income, reduced earning capacity, disfigurement, disability, and a permanent inability to engage in gainful employment. Motorcycle drivers often compensate for the vehicle’s comparatively limited safety protection by going to great lengths to avoid accidents. Traffic safety law violations, such as illegal turns or failure to signal. Unsafe road conditions, including construction, uneven pavement, and inclement weather. At the Shiner Law Group, our award-winning motorcycle accident lawyers understand the unfavorable bias insurance companies hold toward motorcycle accident victims, so we employ innovative litigation strategies to discredit unfound conceptions and obtain the financial recovery our clients need to move beyond their traumatizing ordeal. Our seasoned trial lawyers conduct a thorough and independent investigation of the crash site, track and review relevant documentation (police, medical, and accident reports), evaluate the claim, facilitate insurance negotiations, identify the appropriate defendants, and initiate the lawsuit to hold at-fault parties responsible for their negligent behavior. 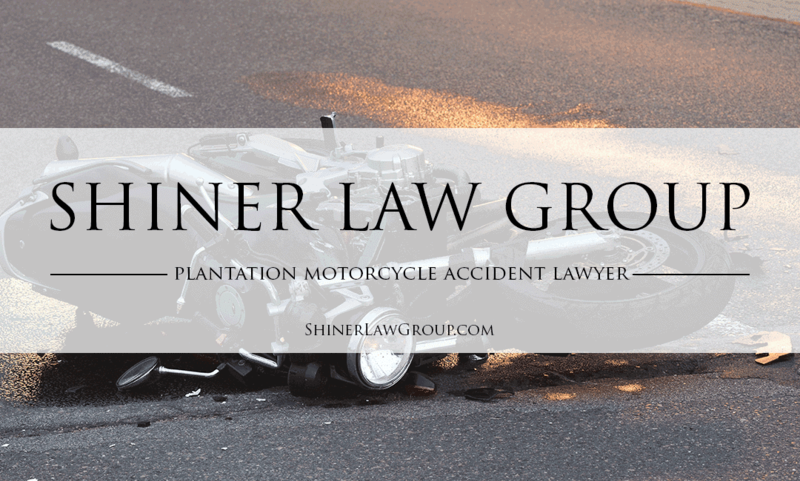 With over 15 years’ experience successfully representing motorcycle accident victims and their families in Plantation, FL, we have secured millions of dollars in settlements and verdicts because we are committed to maximizing your claim’s financial recovery potential. While we make every effort to negotiate a fair settlement outside of court to avoid costly litigation fees, we are equally prepared to take your case to trial to fight on behalf of your legal and financial interests. Motorcycle accident victims suffer from broken bones, chronic pain, scarring, paralysis, head and back injury, internal organ damage, and wrongful death. Our law firm advocates safe riding practices and encourages the use of helmets approved by Snell or the Department of Transportation.